One year after the surge of 1.3 million refugees who entered Europe in 2015 was at its peak, the number of new arrivals this summer has declined sharply compared with last year. But at the same time, the backlog of unprocessed asylum applications has reached more than 1 million and continues to grow, according to a Pew Research Center analysis of data from the United Nations and European Union. In summer 2015, thousands of refugees from Syria, Afghanistan, Iraq and other countries entered Europe daily through Greece and Italy. Germany responded to the humanitarian crisis by opening its borders, allowing refugees to make their way north and west from the Greek islands. In all, Europe received its greatest annual number of asylum applicants since 1985, the first year for which data from Eurostat, the EU’s statistical agency, are available. 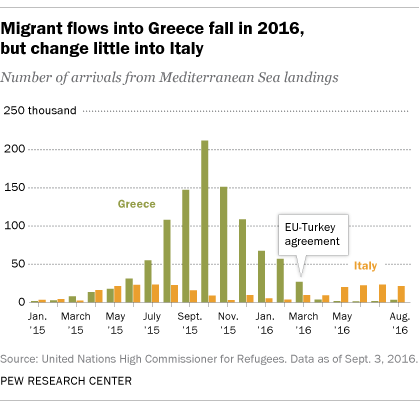 In 2016, people have continued to cross the eastern Mediterranean into Europe, but in much smaller numbers. However, migration could again surge if an agreement between the EU and Turkey collapses following a coup attempt in Turkey. Migration from Turkey into Greece – the transit corridor used by most of 2015’s 1.3 million migrants – largely stopped once the EU-Turkey deal was put in place in March 2016. This summer, an average of about a hundred migrants has landed on Greece’s shores daily, down from the thousands who arrived every day last summer, according to data from the United Nations High Commissioner for Refugees (UNHCR). Meanwhile, migrants continue to enter Europe through Italy by crossing the Mediterranean from North Africa. This year’s flow of mostly sub-Saharan Africans is about the same as last year’s, with nearly 500 daily arrivals on average through August of both 2015 and 2016, according to UNHCR data. After entering Europe, most new arrivals apply for asylum. Asylum seekers are given medicine, shelter and food by local and national governments while they wait for their applications to be processed. 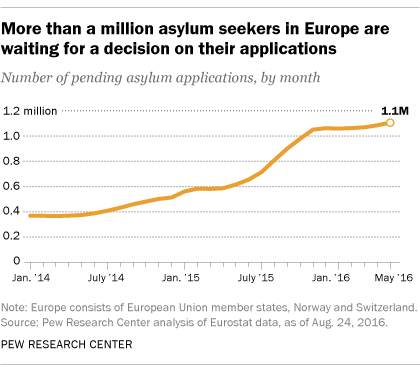 To date, more than 2 million first-time applications have been received by EU member countries, Norway and Switzerland since January 2015, far more than any previous wave of asylum seekers since the years following World War II. The 2015 surge of asylum seekers continues to strain European governments. Since November 2015, the number of pending applications has exceeded 1 million among EU countries, Norway and Switzerland, and could take another year to clear. Not all asylum seekers have their applications for refugee status approved. Between January 2015 and June 2016, applications from about 500,000 of them were rejected. These asylum seekers can appeal the decision, request a temporary extension of their stay in Europe on humanitarian grounds or leave Europe. Rejected asylum applicants can also be ordered to leave the country or deported to either their country of citizenship or the first European country they entered. Asylum seekers from certain countries are more likely than others to receive permission to stay in Europe by gaining refugee status. An examination of applications processed during the first quarter of 2016 shows Syrians have had the best chance of staying in Europe. Nearly all (98%) Syrian applications processed in this period were approved, as were 93% of Eritrean applications. Roughly two-thirds of Iraqi (71%) and Somali (63%) applicants during this time were deemed refugees by EU, Norwegian and Swiss authorities, while about half of Iranian (52%) and Afghan (52%) applicants were permitted to remain in Europe. By contrast, less than 5% of asylum seekers from European countries like Kosovo, Albania and Serbia were given refugee status. The EU has a uniform approach to evaluating asylum applications. As a result, decision rates of asylum seekers have been more or less the same across EU countries, Norway and Switzerland during the refugee surge – with a few exceptions. For example, less than a quarter (21%) of Afghan asylum applications processed in Hungary during first quarter 2016 were approved, far lower than the 52% in all European countries. Also, 95% of Iraqi applications processed in Germany during this time were approved compared with just 12% in Sweden. National governments expect thousands of asylum seekers will be ordered to leave in 2016. A total of 551,000 people were ordered deported from EU countries, Norway and Switzerland in 2015, a 13% increase from the 487,000 receiving deportation orders in 2014. It is hard to tell, however, whether this increase is mainly due to the refugee surge. An even greater number of people, about 600,000 per year, were ordered to leave in 2008 and 2009, despite there being a considerably lower number of asylum seekers than in 2015. Phillip Connor is a senior researcher focusing on demography and migration studies at Pew Research Center.